We specialize in Magic Jump brand. This 5in1 Castle Combo brings fun-filled enjoyment. This ride includes inflated push-through obstacles for riders to navigate through as they proceed to the wall climb leading to the slide platform. The bouncing area is spacious as always and includes a basketball hoop, the slide platform is approximately 9.50 feet high. It is attractively designed with traditional color schemes and with premium quality vinyl, making it a winner for all uses. 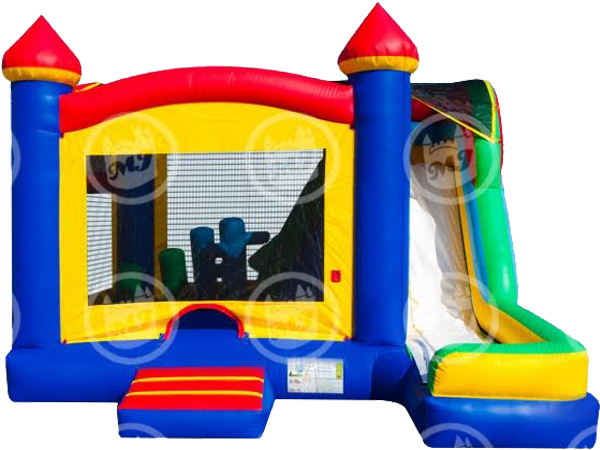 The ultimate combos for Summer time parties and events, the EZ Castle Wet or Dry is a bounce house waterslide combo that features a special non-slippery material that Magic Jump uses in it's inflatables for safe bouncing with water. The EZ Castle Wet or Dry can be used as a dry combo by simply rolling up the pool and securing them with Velcros, or roll out the pool and fill it with water to make for a splashing good time during those hot days! 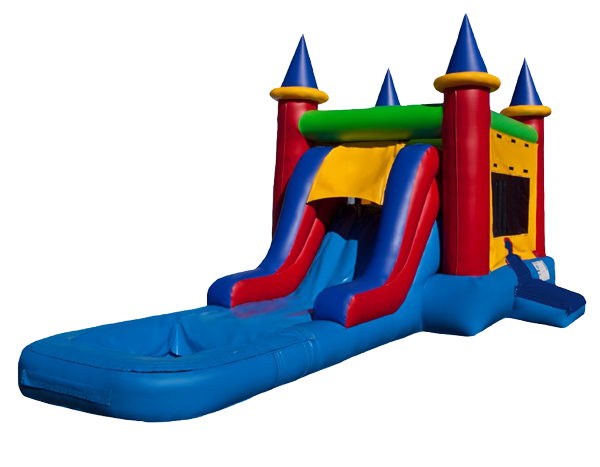 This EZ Castle Wet or Dry features all the elements of a regular combo and a water slide in one fantasticly fun inflatable.